* 1. (B) Graph these parametric equations for values of t between –5 and 5 and for x and y between –2.5 and 2.5. This represents a parabola that opens up with vertex at . Therefore, . 2. (D) D is the only reasonable answer choice. To verify this, note that . So . Adding this to x = sin2t gives . 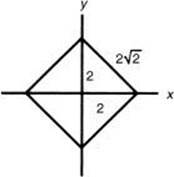 Since 0 x 1 because 0 sin2 t 1, this can only be a portion of the parabola given by the equation y2 + 4x = 4. * 3. (A) You could graph all three parametric pairs to discover that only I gives a circle. (II and III give semicircles). You can also see this by a simple analysis of the equations. Removing the parameter in I by squaring and adding gives x2 + y2 = 1, which is a circle of radius 1. Substitutingx for t in the y equation of II and squaring gives x2 + y2 = 1, but y ≥ 0 so this is only a semicircle. Squaring and substituting x2 for s in the y equation of III gives x2 + y2 = 1, but x ≥ 0 and so this is only a semicircle. * 1. (B) Enter abs(2x – 1) into Y1 and 4x + 5 into Y2. It is clear from the standard window that the two graphs intersect only at one point. * 2. (E) Enter abs(x – 2) into Y1, 1 into Y2, and 4 into Y3. An inspection of the graphs shows that the values of x for which the graph of Y1 is between the other two graphs are in two intervals. E is the only answer choice having this configuration. In the first command, the word “and” is in TEST/LOGIC. The result is a square that is on a side. Therefore, the area is 8. 4. (A) Since f(x) must = f(|x|), the graph must be symmetric about the y-axis. The only graph meeting this requirement is Choice A. * 5. (B) Since the point where a major change takes place is at (1,1), the expression in the absolute value should equal zero when x = 1. This occurs only in Choice B. Check your answer by graphing the function in B on your graphing calculator. 6. (E) Choice A fails if N = 0.5. Choice B subtracts cents from ounces. Choice C fails if N = 1. Choice D adds cents to ounces. 7. (C) Since f(x) = an integer by definition, the answer is Choice C.
* 8. (E) Enter int(4x) – 2x into Y1. The graph is shown in the figure below. The breaks in the graph indicate that it cannot be the graph of any of the first four answer choices.